An opportunity to purchase a three-bedroom semi-detached situated on the outskirts of Horley within a short walk from open countryside, whilst conveniently located for local shops, the leisure centre and popular schools. Upon entering the property, you are greeted with an entrance hall with stairs rising to first floor, wood flooring and access to the cloakroom with low level WC, wash hand basin and tiled walls. A door on your right takes you into the lounge with large window to the front, feature electric fireplace and patio doors into the conservatory. The conservatory is of UPVC construction and brick base, stone flooring, French doors to garden and plumbing and space for washing machine. The kitchen is located off the entrance hall and is fitted with a range of wall and base units, stainless steel sink unit, roll top work surfaces, integrated electric oven, gas hob with cooker hood over, space for fridge/freezer, stone tiled flooring and window to side. Stairs from the entrance hall take you to the first-floor landing giving access to all three bedrooms and the refitted family bathroom. 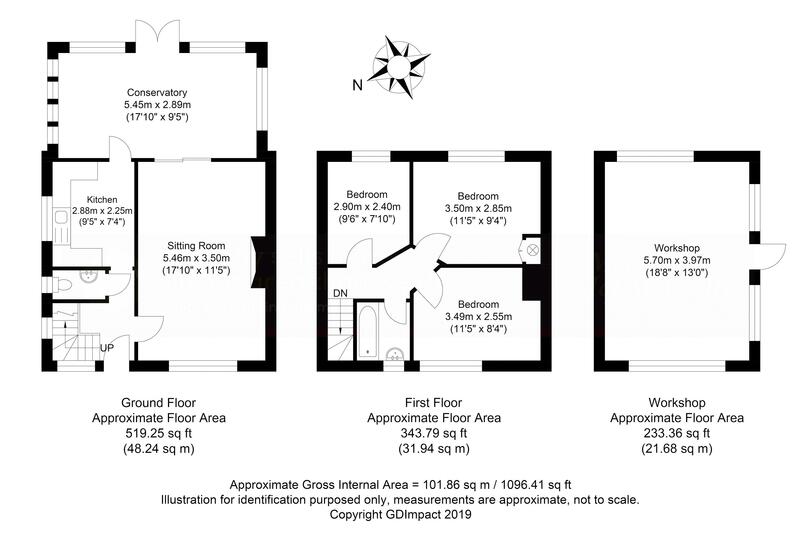 All three bedrooms are of generous proportions, with bedroom two having the benefitting from a cupboard. The family bathroom has been refitted in a white suite comprising of a panel enclosed bath with mixer tap and shower attachment over, low level WC, wash hand basin within vanity unit, chrome heated towel rail and stone tiled flooring. Outside to the front the property there is off road parking and side gate leading to the rear garden. The rear garden is mainly laid to lawn, raised vegetable beds, shrub borders and enclosed by wooden panel fencing offering a great deal of seclusion. There is also a log cabin currently being used as a home office/playroom.